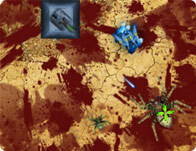 Shoot op zombies and evil creatures that appear on your radar before they get to you. You have to think like a shark, a shark with a machine gun. never stop moving and never stop killing. Unlock various levels and avoid the dreaded skull and cross bone monsters which lurk in plain sight. Kill all the enemies on the screen to progress. The faster you kill, the more points you get. Part 2 of the Virtual Police Saga. There are now 7 locations that can be show instead of only two. Capture your opponent's flag through the fog of war. Grab your paintball gun and stop the bikini babes from getting your gadgets!